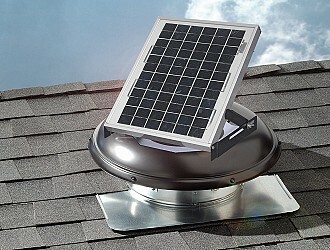 10-Watt Solar - SC8 - Air Vent, Inc.
A smart alternative to conventional roof vents, the Solar Powered Attic Vent operates during the day and collects power from the sun to convert into electricity. In turn, this energy operates a high efficiency motor inside the power vent, so there's no added cost for electricity. That saves energy, which is better for the environment. 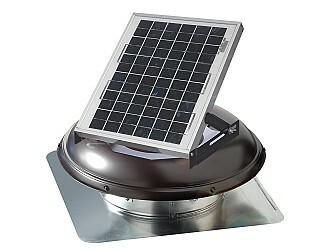 The solar panel comes mounted to the dome on a bracket that tilts and rotates to maximize sun exposure. As a totally solar-powered solution, it's also environmentally friendly. SolarCool collects energy directly from the sun throughout the day and converts it into electricity. This "free" energy powers a high efficiency, 24-volt DC motor inside the attic vent to provide non-stop ventilation from sunrise, to sunset, when it's needed most. Qualifies for Energy Tax CreditSolarCool does not require any wiring or electrical hook-up. Initial installation costs are the homeowner's final costs! It's fast, efficient and affordable. The solar panel is on a bracket, allowing it to be tilted or rotated to the south or west for maximum sun exposure and optimal energy collection. And, because it's a single unit, it's easier to install. It operates during the day under direct sunlight when your attic requires more air movement. Unlike most electric power vents that are regulated by a thermostat, the SolarCool Attic Vent works continuously from sunrise to sunset, under direct sunlight, keeping the attic ventilated all day long instead of waiting for the attic to get overheated. * For larger attics, multiple SolarCool attic vents can be installed. In September 2011, the Whisenhunt family in Longmont, CO wrote Air Vent a letter expressing how pleased they were with the performance of their Air Vent roof-mount solar powered fan they installed near the end of the summer 2010. “We have been comparing our electric usage before and after installation,” they wrote. “The results are that the fan has saved enough in electric bills to nearly pay for the cost of the fan.” Prior to installing the fan they used 7 roof louvers for attic exhaust ventilation. The Whisenhunts installed a second roof-mount solar powered fan April 2012. The charts below show the kilowatt usage and the average temperatures before and after the installation of the fans. Pay particular attention to June-August 2010 vs. 2011, 2012, 2013 into 2014. And see the dollar savings. Finally, see the “Notes” section in which the Whisenhunt’s documented the attic temperatures vs. outdoor temperatures. Their readings fall right in line with Air Vent’s recommendations that a balanced attic ventilation system should keep the attic no more than 15-20°F higher than the outdoor temperature. Note: The Whisenhunt family saved 3.69 in total June-August 2011 vs. the previous year for the same time period. In each of the next two summers they continued to save money compared to 2010 despite higher overall outside temperatures and hikes in electricity costs. The 2012 savings = 7.59. The 2013 savings = 1.11. Sept. 71.00 73.00 73.00 74.00 The attic temperature was no more than 6 degrees warmer than the outdoor temperature after 4 different readings September & October 2012. 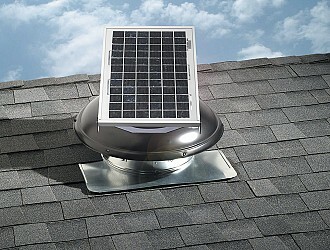 Our solar-powered attic ventilation products may qualify for a Federal Tax Credit. Refer to the “Residential Energy Efficient Property Credit (Part I)” and the “Nonbusiness Energy Property Credit (Part II)” of IRS Form 5695. 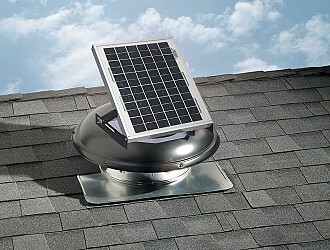 Although attic ventilation products are not specifically listed they may qualify for a credit. Please download IRS Form 5695 for additional details.